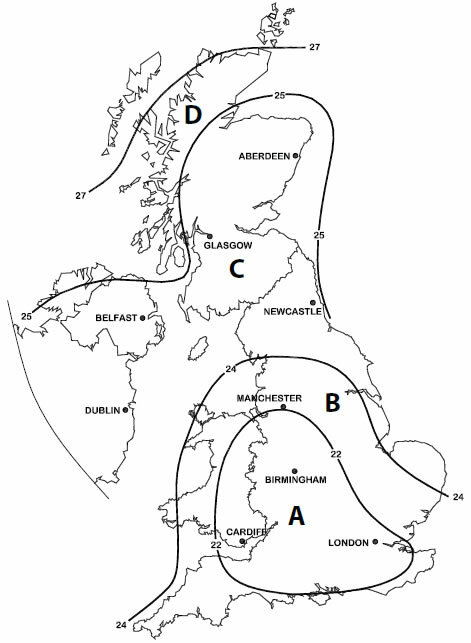 The UK map shows Basic Mean Hourly windspeeds with the contour lines defining areas A,B,C and D. Windspeeds are shown at sea level and for every 100m increase in altitude, the Basic Mean Hourly windspeed increases by 10%, then giving the Site Mean Windspeed. This Map is represented in BS EN 8100, design standard for lattice towers and is also used for wind loading requirements for ILE TR7 (which refers to BS 6399 and this map in Fig. 6). Therefore the wind loading data used in the design of our foundations fully complies with the design standards we use for our CCTV lattice towers (BS EN 8100) and our tubular poles and columns (ILE TR7). Definition of 'Town location' - Town locations are locations within built up areas, with at least 15% of the surface built on, and/or on which the average height of buildings exceed 15m - for locations on outskirts that do not comply with this, 'Country location' for foundation sizes should be used. Definition of 'Country location' - All areas, both coastal, up to 100m ASL and inland up to 200m ASL, that are not 'Town locations' (see table for higher altitudes). Our standard designs are based on a mean hourly wind speed of 28.8 m/s (metres per second).This table shows the conversion from this mean hourly wind speed, to other internationally recognised wind speed measurements. Conversions are taken from the International Code Council 'International Building Code'. The actual wind velocity for a 28.8 m/s mean hourly wind speed = 50 m/s, 111 mph, 180 kph.